By way of wishing anyone stumbling across this blog a Happy Christmas here's a programme of words and music called Once in Royal David's City broadcast on Radio 2 on Christmas Day 1982. You'll hear Deryck Guyler, Dana, Leslie Crowther, Percy Edwards, The Riding Lights Theatre Company, Frank Topping, Magnus Magnusson and The Bishop of Winchester John Taylor. Long before he became the housewives' favourite and interviewed Prime Ministers Jimmy Young was a bit of a crooner. Years later Terry Wogan would still refer to The Man from Laramie, one of JY's two number one hits from the mid-50s. 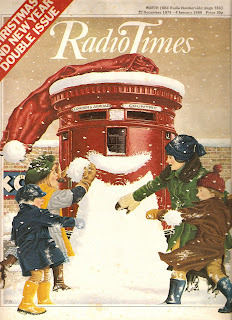 As far as I know this programme, from Christmas Day 1979, is the last time that Sir Jim sang on the radio. He's accompanied by the BBC Radio Orchestra conducted by the great Neil Richardson (Neil sadly died earlier this year) along with guests The Mike Sammes Singers, who must have clocked up 100s of hours of radio programmes over the years. The announcer is Paddy O'Byrne. 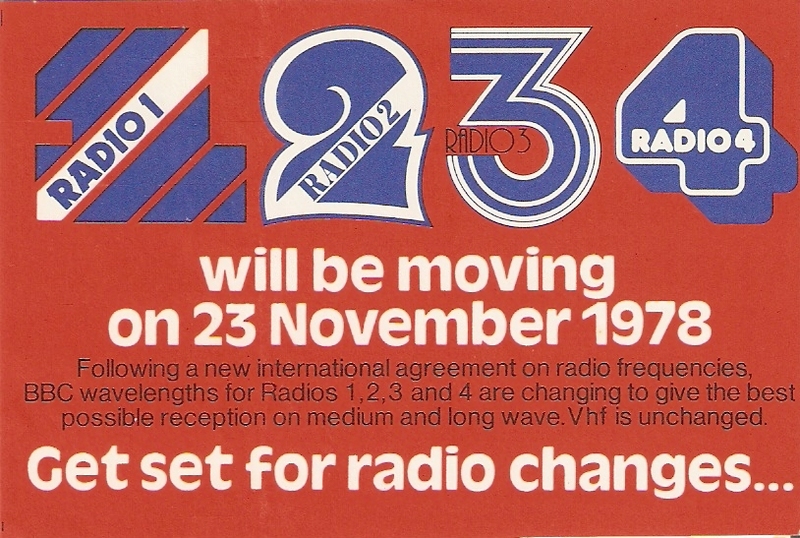 The biggest single shake-up in UK radio broadcasting happened on 23rd November 1978 and affected all four national services. 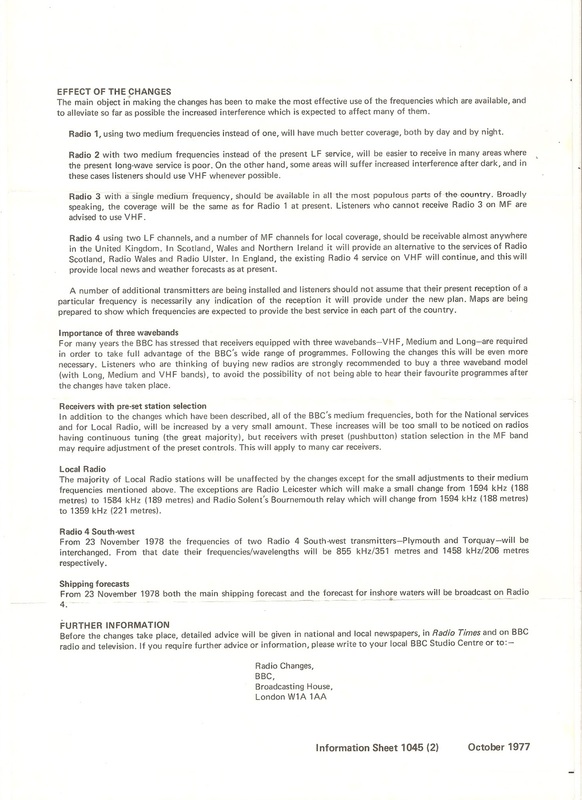 In the months and weeks leading up to the big event the BBC publicised the changes on air and in the press. 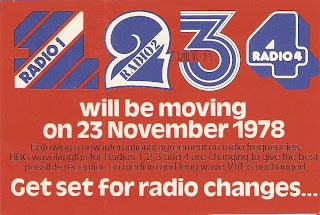 Remember those stickers issued with the Radio Times to put on your radio dial? Radios 1 and 2 commissioned new jingles from JAM Creative Productions in Dallas and Radio 4 rebranded itself as Radio 4 UK. 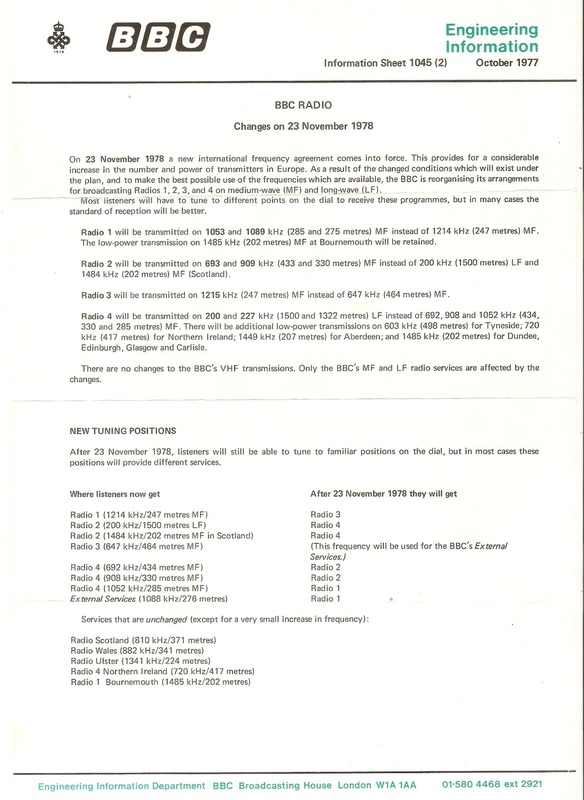 There's already quite a bit of audio on the web about the frequency changes, see the Vintage Broadcasting site (no longer online as at Jan 2012) for example. I'll be posting a lot more, by instalments, over the next few months. To kick things off here's some audio of the BBC tv coverage on Nationwide on the evening of the 23rd. For the record you'll hear Nationwide presenters Sue Lawley and Glyn Worsnip. On the radio there's Kid Jensen, John Dunn, Patricia Hughes, Moira Stuart and Week Ending featuring David Jason. The Managing Director of Radio is Aubrey Singer and you'll also hear The Kings Singers. The Radio 4 newsreader, who gets talked over, is Colin Doran. At the end of the Nationwide clip I think it's Hugh Scully and John Stapleton. The tape runs on into an announcement by BBC1 North announcer Vanessa Hill introducing Tomorrow's World. 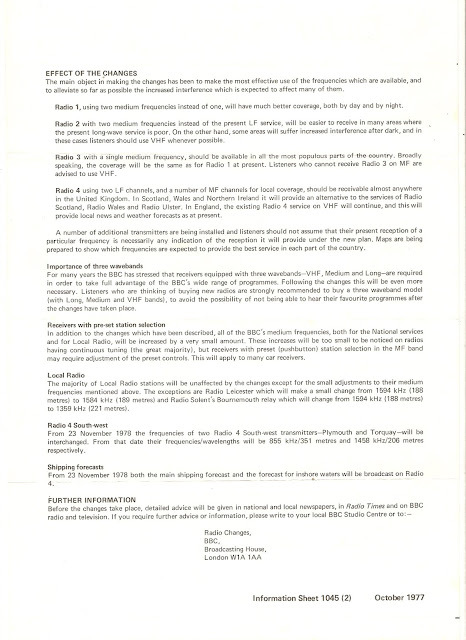 From October 1977 BBC Engineering Sheet 1045 explaining the new frequency arrangements. 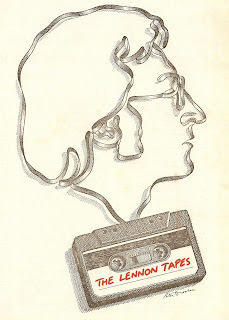 Today as the world remembers the violent and tragic death of John Lennon 30 years ago here are my audio contributions. 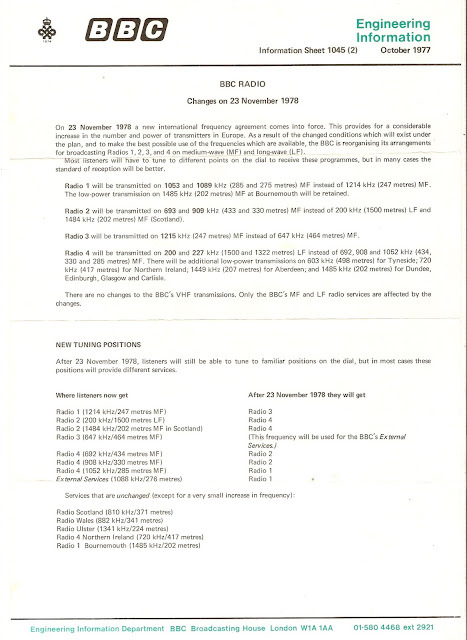 This is how Radio 4's Today programme reported the news on the morning of 9th December 1980. First, Brian Redhead talks to Tom Brook, one of the first reporters on the scene. Next a report by John Spicer, this includes the John Lennon's Radio 1 trailer for the interview he did with Andy Peebles. From Radio 4's PM programme that same evening here's a report by Peter Marshall that includes George Martin and David Geffen. Finally a short undated clip, possibly January 1981, of a Radio 1 news summary read by Bill Bingham. Good Morning Great Britain, Is Anybody There? Tom Edwards was another of the pirate radio DJs (Radios City & Caroline) who joined the BBC shortly after the start of Radios 1 & 2 in 1967. He also worked as an announcer on Thames TV, as did David Hamilton – see, I said there’d be a thread running through these posts! Here’s 30 minutes of Tom’s show from Christmas morning 1982. I make no apologies for fading it out when Orville the Duck appears. And because this show doesn’t feature the usual opening here it is from January 1980. More David Hamilton, this time from the 1980s. 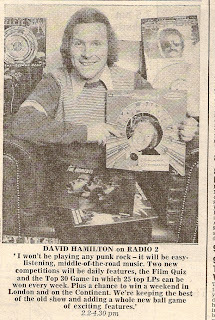 By November 1977 David’s afternoon show was now on Radio 2 only. 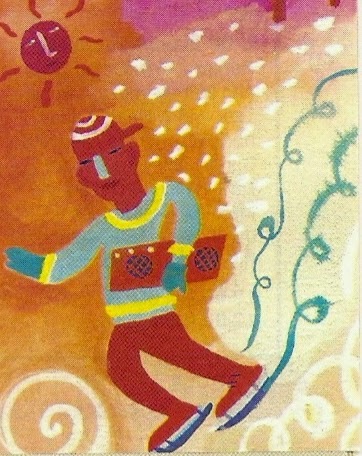 He continued in this time slot until early 1980. Here’s the end of that last show on 4 January. The clip also includes a minute or so of David Symonds introducing Much More Music. From 18 February 1985 this is a 45 minute extract from his daily show. By now back in the afternoon sandwiched between Gloria Hunniford and John Dunn from 4 to 6 pm. I recorded each of the DJ hosted shows on this day in 1985 (one on each side of a C90 cassette so just 40 odd minutes or so) and I’ll post those shows later. Finally, here’s the end of David Hamilton’s last show on the BBC from 19th December 1986. He left the station apparently complaining that the music policy was "geriatric". So there I am listening to David Hamilton’s afternoon show on VHF and at some point I stop tuning to 247 and stay with Radio 2 for Waggoners’ Walk. Waggoners’ Walk was the daily soap set in Hampstead, North London. A little racier than The Archers was at the time, it ran from 1969 to 1980. This audio posting includes the last ever edition from May 1980 with the somewhat low-key cliffhanger as to whether Sophie Richmond would accept George Underdown’s marriage proposal. There’s also part of that evening’s Radio 4 Six O'Clock News covering the end of the series which was part of the BBC’s budget cuts at the time, the newsreader is Brian Perkins. Plus I’ve tagged on part of the final omnibus edition, broadcast on AM only complete with its different theme tune arrangement. But I got “into” radio when I started to get into pop music late 75/early 76. In those days we had no commercial radio in East Yorkshire, or North Humberside as they insisted on calling it at the time, so when I got home from school the only option was Radio 1. 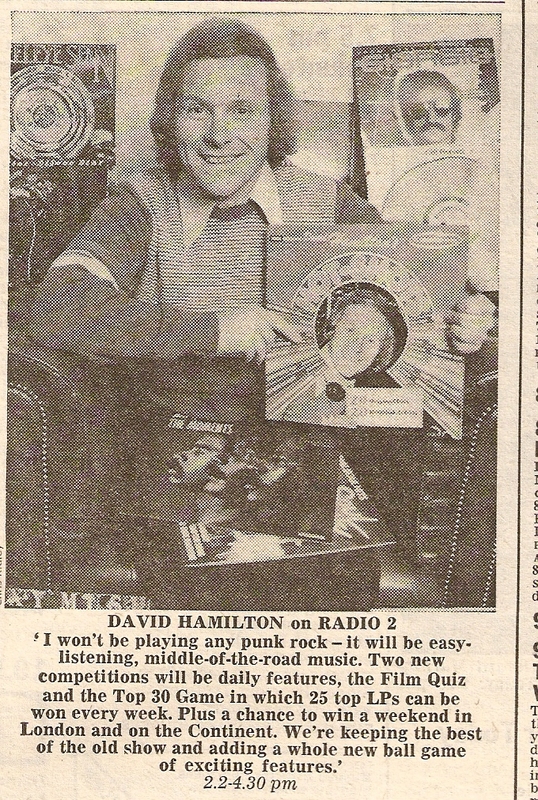 The mid-70s was a time when Radio 1 and 2 shared the afternoon programme so I soon became hooked on David Hamilton’s show in all its glorious stereo on VHF. And after he’d finished at 4.30 I’d switch over to It’s DLT OK on 247 metres. In the days before downloads, and very little pocket money, the quickest way of getting hold of music was to sit with your finger poised over the pause button on your cassette recorder. But before long I was recording the bits in between the records as well, all those jingles and announcements. So started my collection of programmes and jingles that continues to this day. Unfortunately I didn’t record much of David Hamilton’s afternoon show back in the late 70s, cassette tapes were still a bit pricey for me. But here is a collection of some of those Hamilton jingles with his mystery stars, hotshots, daily dollies and tea breaks. (Apologies for the somewhat variable quality). So lets start with a signature tune, or indeed several signature tunes. There was a time when virtually all radio programmes and DJs had their own sig tune. Nowadays you’ll mainly hear them on Radio 4, everyone knows the sig tunes for The Archers and Desert Island Discs even if they don’t listen to the programmes. A sig tune could’ve been a hit record from the time – Gary Davies with ABC’s The Look of Love, David Hamilton with Listen to the Music by the Doobie Brothers – or it could just be a piece of library music chosen by the show’s producer – Town Talk for Jimmy Young or Number One for Saturday’s Sport on 2. Back in the 50s and 60s every comedy show had it’s own specially composed theme, think of Wally Stott’s for Hancock’s Half Hour or Bill Oddie’s Angus Prune Tune for I’m Sorry I’ll Read That Again. In the current Radio 1 and 2 schedules there are only a handful of programmes with opening themes that spring to mind. On Radio 2 Pick of the Pops, Sounds of the 60s, David Jacobs, Steve Wright and Friday Night is Bath Night (as Ray Moore used to call it). On Radio 1 perhaps only the Cheesy Song qualifies. Here’s a short montage of well known themes used on Radios 1 and 2, no introductions necessary I hope. Back in 1980 there was a seven-part Radio 4 series on signature tunes called Signing On, written and presented by David Rider. David started with the BBC in the 60s and was in at the start of Radio 1; he appears in the famous DJ line-up photo on the steps of All Souls Church in Langham Place. He went on to present Radio 1’s Playground in the 80s and then devised the Radio 2 radio nostalgia panel game On the Air. Here’s the second episode which focuses on news themes. My first tentative steps into the blogosphere. So what can you expect to see? Well a little about our new life here in France for family and friends. But mainly I'll be using it as an excuse to dust off some cassettes in my archive and post some random bits of radio broadcasts from the last 30 odd years. I'll be posting stuff that I've not found elsewhere on the web. There may be a bit of a thread running through the posts (but possibly not) and I'l give a bit of context where I can. In the immortal words of Tony Blackburn "so let's away".